Can Love & Prayer Save 2 Small Boys? Last Friday we received the devastating news that the High Courts of India decided to reunite these two beautiful boys with their physically abusive parents, for a one month trial. Our family sponsors Chandan and we do monthly play dates at the children’s home where they live. The father is out on parole after serving a shorter than expected sentence for murder. And the mom is violent, threatening, and unrelenting in her struggle for power. The boys were forced by their parents to beg as street dancers, like trained monkeys, which is what led to their rescue and move to the children’s home two years ago. The parents will be back in court on Nov 14, fighting for permanent custody. If they win, these kids will slip through our fingers – likely forever. Between now and Nov 14, Andy and I are trying to do anything we can to influence the Court’s decision that day. We’ve reached out to lawyers, reporters, clergy, friends, child welfare advocates, even a Nobel Peace Prize winner – and now I’m reaching out to you. I believe in the power of prayer. And even if you don’t, hopefully we all believe in the power of LOVE. Please shine your love and light into the world for Chandan and Nandan – every day, several times a day, when you lay your head down on your pillow each night, when you wake up and have your morning coffee….PLEASE! Please keep these boys in your heart for the next 3 weeks – and send love to them, to their parents, to the courts, to the children’s home where they are loved and where they were safe, to the child welfare watchdogs….to everyone involved! Our love can influence this decision on Nov 14. I believe that. Andy and I are working every angle, chasing every lead or creative idea we can think of, here in Delhi. If you could do the loving part – HARD – we would be forever grateful! Please don’t stop! Seems like prayer, if you’re into praying, and hard loving wherever you stand on prayer, are easy things to do. Their stories are about growing up in immigrant families, with parents working long hours six and seven days a week and very young siblings resolutely looking after each other. But their focus is on the future – a better future for people everywhere. Humankind. A dozen young immigrants – Dream Riders – are sharing their stories, and their hopes for the future, as they bike from Seattle to San Diego on a Journey to Justice, part of the Citizenship for All campaign. The support van traveling with them carries the usual – First Aid supplies, water, energy bars – and one not so usual essential: a lawyer. That’s because eight of the riders do not currently have legal status and their route is filled with pitfalls like immigration checkpoints. If they’re stopped they follow this protocol: Keep calm and quiet. Don’t consent to being searched. Call the lawyer. The group stopped by Calvary Presbyterian Church in San Francisco recently for breakfast and a brief press conference. Hearing their stories, and the stories of some supporters, was a reminder of how lucky America is to be a nation of immigrants – especially with immigrants like these still wanting to become citizens despite the hurdles and hostility they face. Mi Jin Park, currently protected by DACA, spoke eloquently of being at school with her brother when they were 5 and 7, in a crowd of children waiting for permission to leave with their parents. Park would tell the teacher in charge that she and her brother had to meet their mother on the corner – and then the two would run all the way home, to their tiny apartment in a sometimes scary neighborhood. They would lock the door and look after each other. Her brother would constantly call the nail salon where their mother worked long hours six days a week, just to hear her voice and ask when she would be home. “When I think of those immigrant children now being separated from their parents at the border . . .” Park began . . . but she couldn’t finish the sentence. Some of the Dream Riders and their supporters entered the U.S. via harrowing journeys through deserts or wading across the Rio Grande river in the middle of the night. Some came long ago on tourist visas and simply stayed. It was very hard to meet these bright, funny, energetic young people and go home to PBS NewsHour’s report of the latest characterization of “illegal aliens” by some leaders of our country. The Dream Riders are being sponsored by NAKASEC (the National Korean American Service and Education Consortium,) HANA Center, nd the Korean Resource Center. Any of them would welcome your support. What do they want? Just a chance to live freely and to contribute to their community. (NAKASEC works for, among other things, Youth Empowerment, Education Access and Adoptee Rights.) What precepts do they follow? Live Right, Know Your Roots, Live Strong, Live Together. Who has not received – usually with a little dread – that windowed envelope? Because it means a day, or a week, or a month or more of your life has just been appropriated for Citizenship Duty. That is, after all, what Jury Duty is all about: being the Good Citizen. Doing what you can for the greater good of your fellow citizens. Actually, I have always loved jury duty. Over the years, my jury duty experiences have ranged from the sublime to the ridiculous. There was the sweet young thing who scammed a few dozen friends and relations out of a few thousand dollars each, and wanted us to believe she really meant just to make everyone rich and didn’t understand why anybody was mad at her. The unanimous vote to convict came by about the time we got seated and organized. There were times we deliberated to the point of exhaustion, and times I wondered if a better lawyer would have had us voting differently. There were plenty of times I spent a day or two and wasn’t chosen for duty; usually with a great sense of relief. There was the time, in a jury pool for a domestic violence case, when the defense attorney introduced his spiffed-up client, and addressed the pool: “There could be implications about Mr. Smith… that he had a few glasses of wine…” The attorney smiled knowingly at us, wanting to be sure we’re all grown-ups and what’s a few glasses of wine after all? I was tempted to say, “Man, don’t give me that bull. 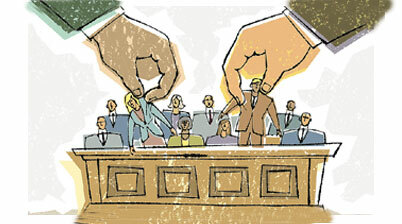 You don’t want me on this jury, I will so fry your client.” But I asked to be excused, saying I felt personal bias would make it difficult for me to remain open-minded. The only other time I asked to be excused was when the case involved two corporate entities and some sort of asbestos issue. The judge told us at the beginning that it could run six months. Six months? A couple of corporations wanted 12 citizens (plus alternates) to give up six months of their lives to settle something they should lock their lawyers into a small room to work out? I was beyond irate. The judge invited anyone who felt jury service would be a hardship to come to an adjacent room; virtually the entire pool rose. Uncertain what exactly I would say I began, “My brother-in-law is a chest physician…” and that was as far as I got. “Excused,” said the judge, without looking up. I wasn’t actually very sure where I was going with that explanation, but apparently the judge just wanted to get it over with. I felt sorry for him. But that’s the way the system works. Good people go to law school, get to be judges and have to sit through all this. More good people give up their time to try to find justice for other good people and perhaps a little justice for the bad guys while they’re at it. For now, though, I’m opting out. 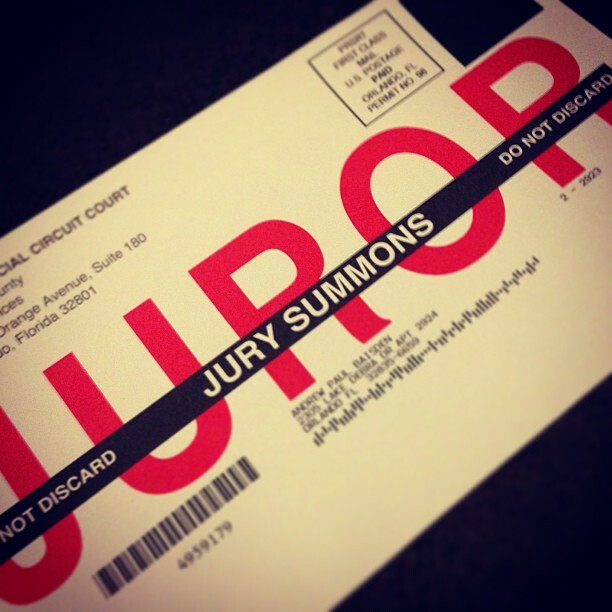 This presents a problem, since apparently you never age out of jury duty and there is no excuse box for Overwhelmed. 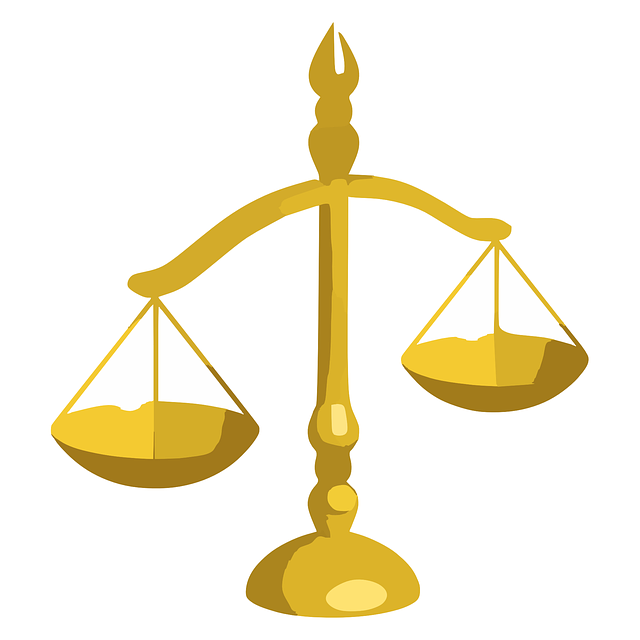 One can opt out if under 18, not a citizen, or if one has been convicted of a felony or malfeasance in office. Or if one has a physical or mental disability. None of the above quite worked for me. At last. A reward for the caregiving business. Does caregiving equate to good citizenship? One hopes. 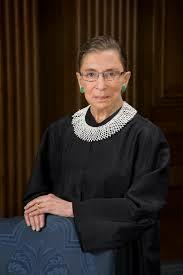 Ruth Bader Ginsberg is too old? Perhaps she should consider stepping down from the Supreme Court? These suggestions were floated more than once in the Q&A session after a recent Commonwealth Club talk by University of California Hastings Professor of Law Scott Dodson. Dodson is the editor of a newly released collection of essays, The Legacy of Ruth Bader Ginsberg, whose writers suggest nothing of the kind. Contributors to the book, and Dodson himself, focus instead on the significant contributions made thus far by the 82-year-old justice, and the impact she continues to have on jurisprudence and on life in the U.S.
As New York Times columnist Gail Collins wrote several months ago: Ruth Bader Ginsberg has no interest in retiring. Several days before the Dodson talk, David McCullough, 82, spoke at another San Francisco event in conjunction with his most recent book, The Wright Brothers. McCullough did not go into detail about his next project, but gives every indication that he is a writer with no interest in retiring. 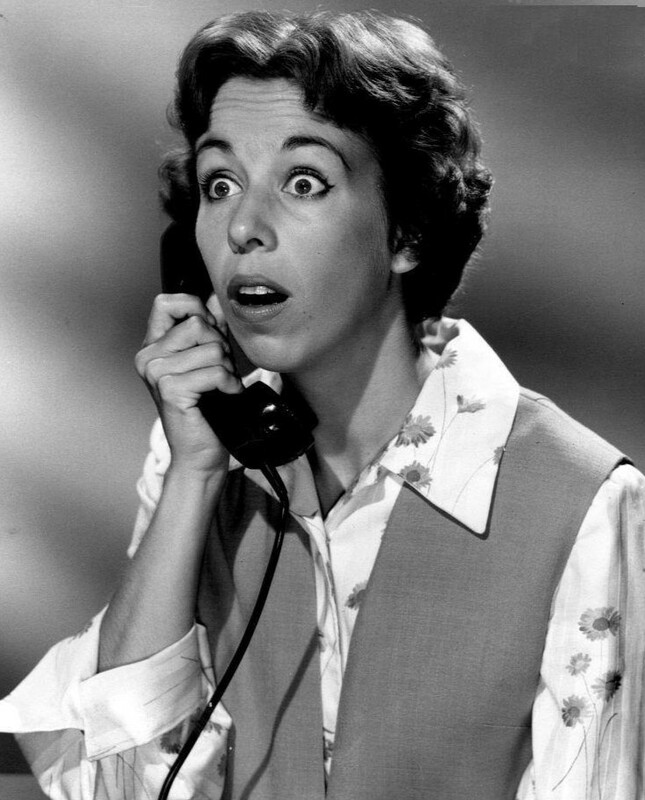 Meanwhile in Texas, Willie Nelson, 82, has another concert coming up, and the next show planned by Carol Burnett, 82, is almost sold out. This writer may not have anything else in common with Ruth, David, Carol and Willie, but we take what we can get. 1933 wasn’t a bad year to be born. 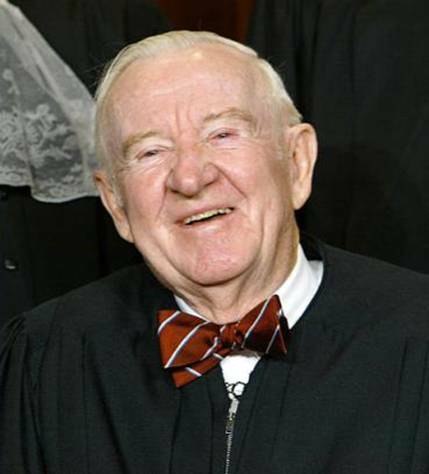 Retired Justice John Paul Stevens, a man of many accomplishments, comes across as a man of few regrets. The latter might be summed up in two words: Citizens United. His regrets over that controversial 5-4 decision, handed down just months before he left the Supreme Court, are strong, and many. Stevens, who turned 95 in April, appeared recently at an event in Washington DC co-sponsored by the Alliance for Justice and George Washington University Law School. Introduced by AFJ President Nan Aron, Stevens was interviewed by Slate senior editor Dahlia Lithwick and Washington Post opinion writer Jonathan Capehart. Stevens demurred on several issues such as the benefits or evils of social media and citizen journalists: “I’m not a good person to ask about that.” But on most points he was crystal clear. Asked by Capehart why he had changed from the conservative he was considered when first named to the bench to his later identification as a liberal, Stevens said, “I didn’t change, the Court changed.” Every member appointed from 1981-91, he pointed out, was more conservative than his predecessor. Fielding questions five years later, the renowned Justice showed no problem articulating his thoughts. Including the need for electoral reform – and the need to overturn Citizens United.